I was amazed to see that no one intervened to help the oppressed. So I myself stepped in to save them with my strong arm. The Scriptures never invalidate or minimize the effects someone’s harsh actions and cruel words have on another person’s soul, spirit, and body. A cursory reading through Scripture amply illustrates God’s disdain for mockers, abusers, deceivers, those who misuse their power, oppressors, revilers, ragers, hypocrites, and slanderers. For example, the psalmist says, “Your tongue cuts like a sharp razor; you’re an expert at telling lies. You love evil more than good and lies more than truth. You love to destroy others with your words, you liar!” (Psalm 52:2-5). David cries out to God, “Please listen and answer me, for I am overwhelmed by my troubles…My heart pounds in my chest. The terror of death assaults me. Fear and trembling overwhelm me, and I can’t stop shaking…It is not an enemy who taunts me—I could bear that. It is not my foes who so arrogantly insult me— I could have hidden from them. Instead, it is you—my equal, my companion and close friend” (Psalm 55:2,4-5,13). Sadly, we’ve sometimes failed to validate the destructive consequences of living with a foolish, argumentative, angry, deceitful, contentious, indifferent, hard-hearted, or evil person when the Scriptures are quite clear that the effects are real. The psalmist said, “Their insults have broken my heart and I am in despair” (Psalm 69:20). I wonder if sometimes we haven’t valued honesty as much as we preach it. When a woman goes to her church leadership and discloses what’s going on at home, she hopes to be supported and protected, but for some women, that’s not her experience. Instead, she’s been scolded, shamed or shunned. She’s been told to bring her husband in for his side of the story. How can she speak honestly with him present if she’s afraid of what will happen when they get home? She’s been told that she needs to be more submissive and try harder to make things work. She’s been told that there is nothing in the Bible called emotional abuse and therefore what she’s experiencing has no validity. 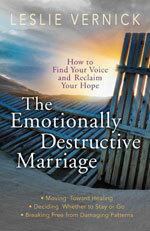 She’s been told that God wants her to somehow figure out how to make her marriage work because God hates divorce. By our words are we telling her we don’t want to get involved or help her? Do we inadvertently encourage her to keep quiet, placate, and pretend? And, if she refuses and gets persistent or demanding in her plea for our help, do we start to label her as aggressive, contentious, rebellious, unsubmissive, deceitful, or unstable? I think sometimes we’re afraid to get involved because, if we open our eyes to what’s going on in some homes, we’re not sure what to do. We’ve valued the sanctity of marriage over the safety and sanity of the people in it. Therefore, we’ve encouraged women to put up with abusive behavior rather than speak up or stand up and have our biblical categories challenged. Yet, Jesus commended the persistent widow in Luke 18, who kept pestering the judge for legal protection against the injustice she was experiencing. 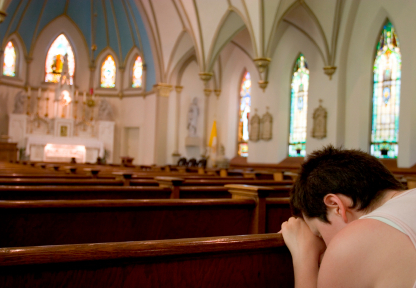 God has put the church together not only to model a loving family to a broken world, but also to model justice and protection when one of its members is destructive and unrepentant towards another. Question: I come from an abusive background (physical, emotional, verbal). I am divorced for more than 3 years. I'm dating a man whom I find to be a very generous, godly man; however, he is (as I've noticed from the beginning of dating) very outspoken and has a strong personality. We have been dating a little over five months. We are very compatible. He's good with my two boys, and we have talked about the possibility of getting married. My only real concern is when we disagree-- the things he says really get me down. They seem condescending, but I don't know if I have a clear filter through which to view our relationship or not. There is no name-calling (our first spouses did this to us and we both know what it feels like to be on the receiving end and agree not to call names). There are just strong words. I have talked to him, and he hears me out fairly well, but I do feel like the disagreements (the words he spoke) have eroded some of the emotional trust I have in him, and I don't feel as emotionally safe. However because my marriage was such an extreme example of unhealthy, I don't know if I'm overreacting and projecting negative things onto my current relationship or if my current relationship is actually unhealthy. I'm not sure if I feel emotionally unsafe due to pre-conditioning from my past or if it is coming from a place of truth in the current relationship. I read one of your articles that said a difficult relationship is not the same as a destructive one. I'm experiencing emotions (as part of being in my first dating relationship after an abusive marriage) that are part of moving on. I would like help in categorizing them. To be honest, my hope is that I'm filtering incorrectly because I see so much potential in our relationship and really don't want to see it end. He seems to genuinely care for me and my boys. My family is very supportive and like him, and my friends like him and say we seem very right for each other. People who have not met him but have seen pictures of us together say we look very happy (and these are unsolicited comments mostly from Christian believers I know). His friends seem to like me as well. A destructive relationship is one in which the personhood of the other is regularly diminished, dismissed, disrespected and demeaned. There is a lack of mutual effort at maintaining and repairing relationship wounds. The is a lack of mutual accountability, but rather one has power over the other either physically, emotionally, financially, mentally, spiritually or all of the above. There is a lack of accountability or responsibility accepted for harm caused to the relationship, and relationship wounds are denied, minimized or blamed on the other. We have a great community of women who can also give you some good tips. I have been so busy finishing up my book that I haven’t joined in on all the discussions, but I’m going to work hard to change that. I invite our wonderful community to help you now to discern whether this relationship is something you should keep working on or run from. Friends, can you give us your thoughts? Reregister To Continue Receiving Our Newsletter! Plus listen in to Leslie's interviews with Focus on the Family! Do You Want To Get Well? 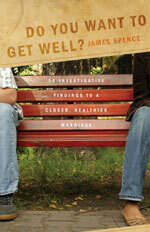 Book by James Spence . Plus see the winner of the previous give away! We have switched newsletter providers. We have discontinued our old newsletter provider (Constant Contact) as of March 1st (2013) to eliminate the multiple copies some followers are getting. If you haven't yet registered with our new provider, please do so now to continue being a part of this newsletter community. Use the link below to reregister using the opt-in box in the upper right hand corner of the webpage. LESLIE'S INTERVIEWS WITH FOCUS ON THE FAMILY! The statistics are sobering: 50 percent of all first marriages, 60 percent of second marriages, 70 percent of third marriages, and 80 percent of fourth marriages end in divorce. Instead of living the abundant married life God intended, most couples tolerate, avoid, fight with, keep secrets from, and become emotionally disconnected from each other. If spouses were guaranteed no financial loss or feelings of guilt, fear, loneliness, shame, or alienation, nearly 80 percent would divorce their mate. Most couples are unaware of God’s plan and purpose for their marriage. Despite this bleak picture, Do You Want to Get Well? offers abundant hope. The author’s fourteen investigative findings uncover attitudes, actions, and behaviors that empower readers—divorced, single, married, and those contemplating marriage—to attain the joy and intimacy they desire and God intended. James Spence is an FBI agent and a retired Lieutenant Commander in the U.S. Naval Reserve. A former Navy pilot and a Naval Academy graduate, he received his master’s degree from the University of West Florida. The single father of three lives in Bethlehem, Pennsylvania, where he serves as a contemporary worship leader at his church. Just email your name to assistant@leslievernick.com by midnight Friday, March 15th for a chance to win one of two copies! Congratulations to are Veronica O. of Tullahoma, TN and Bobbie R. of North Canton, OH winners of the GROW YOUR MARRIAGE BY LEAPS & BOUNDARIES Book by Jerry L. Cook. "Leslie has helped me so much with my marriage. We had been to several counselors in the past but they didn't offer any constructive feedback. Leslie offered great feedback right away. She coached me how to be 'heard' by my husband by talking in a manner that was more constructive. I also learned to face my fears and to be willing to stand up and speak up for myself. When my husband realized that he could no longer manipulate me he became a better person. My marriage is better now than it has been for 9 years."